The tragedies of our lives get buried. Almost immediately after something terrible happens, the burying begins. It’s only natural. If we look too closely at any loss, we tend to find ourselves contemplating the fragility of our existence a little more than we can bear. Like a rush of vertigo, tragedy fills us with the realization that everything we know could disappear at any second. The modern world may be built on the mundane reassurances of day to day novelties – News! Weather! Sports! — but in the big scheme of things, our continued existence (let alone our continued happiness) is anything but certain. 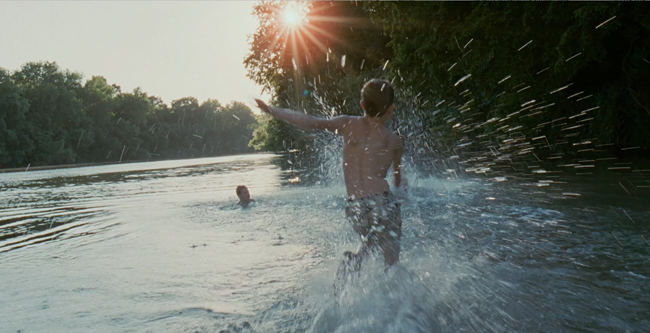 Terrence Malick‘s The Tree of Life rips open the seams of beauty and dread that lie behind one loss. Malick takes a small story about a family and transforms it into an existential voyage, through loosely connected images and music and dream-like moments that are designed to conjure a kaleidoscope of emotional responses. If that sounds hopelessly ambitious, well, Tree of Life is about as ambitious as it gets, straining as it does to capture the impossible beauty of life on earth. It’s clearer than ever why Malick chooses images that are so pristine, so idealized. He makes films about how it feels to be alive – not what it’s actually like or how it actually looks, but how it feels, and how those feelings sparkle and shine in the haunting space of memory. When the sun sets behind the wheat in Days of Heaven or clouds and sunshine move across the grass in The Thin Red Line” we are made desperately aware of our own survival instinct. In The Tree of Life, Malick offers the impressionistic, evocative details that you find in the best novels, only he delivers them through sounds and images that are already wired into our brains so deeply that they incite a flood of emotional responses: the branches and leaves of a huge oak tree, whipping around in strong wind, boys laughing and running barefoot through empty neighborhood streets, the sound of waves crashing on the shore, a baby’s face in extreme close-up, then his hands, stretching to reach his big brother’s flinching face. The film begins with a boy named Jack, growing up in a small town in Texas with his family. We flash forward and back in the boy’s life, then zoom in (to a specific moment of loss), zoom out (to the universe) and zoom in again (to a baby’s first cries). Riding along with Malick on this poetic rollercoaster feels heady and dangerous from the start. We know it’s going to be a wild trip, but we have no sense of where we’re going or how it will end. To say that Malick thwarts our expectations of the cinematic narrative is a little bit like observing that Michael Jordan is good at jumping. The central arc of The Tree of Life follows a process of reckoning that has few temporal moorings. The pace of the film isn’t just patient — there is no pace, because having some pace would assume a destination. The only thing that’s clear is that any revelation or resolution here will be hazy at best. This departure from anything resembling a conventional narrative becomes more obvious in the unfolding of a little interval segment that encompasses… well, the dawn of creation, among other things. As tough as it is not to chuckle and smirk at the outsized ambition and head-swimming grandiosity in play here, it’s probably worth a try, because Malick has rendered the mundane so exquisite and surreal that we can’t casually reject it simply because his scope often transcends our ability to make sense of it. We quite naturally want Malick to meet us halfway, to serve up the beautiful shots of stormy skies and wind in the trees, but also to give us some more clues, some more dialogue to hang all of this free floating emotion around. And it’s pretty tough not to balk at some of his more audacious choices – the CGI rendering that might look more at home in a biochemistry textbook, for example. But these efforts to place one boy’s life story in the context of the history of all time may amount to a rather elaborate attempt to put a tragedy into perspective. A glimpse of the sun shining behind the side of planet earth has a way of making human foibles look small and transient. With a wide enough lens, a whole lifetime can look like a brief favor, granted by the universe, and our stories can seem as simple and as concise as haikus. We light up like fireflies in the night and then go dark. We’re tossed around by the fates, but our biggest catastrophes aren’t even a blip on the cosmic radar. What Malick does best of all, though, by zooming out to a wider universe, then zooming in to the buzz of a dragonfly lingering by a sad scene at a swimming hole, is mimic our own attempts at putting our stories in perspective. He captures the first decade of Jack’s life in flashes, the way we might remember our own childhoods: quiet images of a baby in his mother’s arms, a toddler walking through the grass on wobbly legs, a boy running behind his brothers through the woods. There are countless breathtaking shots that must’ve taken days or weeks to perfect. My favorite is a shot from the branches of a tree, looking down onto the grass, where the erratic play of two boys running in circles mirrors the motion of two dogs frolicking in the same frame. Malick slowly prepares us to take in just how whimsical and sensual and malleable the lives of children are, how they drink in everything around them without knowing whether it’s milk or poison. Finally the scene is set for Jack’s father – well-meaning, impatient, controlling, passionate – to step in and incite palpable fear and anguish in his children’s sweet bubble. What’s heartbreaking — and also courageous, and important — about Malick’s story is that Jack’s father (played by Brad Pitt) isn’t a terrible guy. Instead of serving up either Superman Daddy or Mean Daddy (“Which is he?” we wonder in spite of ourselves, conditioned by countless narratives to expect one of the two), we’re presented with a confusing blend of oppressive and warm and flawed. We develop an uneasy feeling about this man that mixes equal parts affection and suspicion, love and fear, longing and dread. The father here, like any adult, has strong opinions and ideals. He’s trying to teach something important. But he’s not in complete control of himself, so he tries to control everyone around him instead. “For the next half hour,” he says to one son at the dinner table, “will you not speak unless you have something important to say?” This is a man who makes mistakes, day after day, and obviously feels terrible about them. “You have control over your own destiny,” he urges his offspring, while he himself is tossed around like a toy boat on the high seas. He’s just like someone we know, just like our own fathers, just like us. Most films distill life down to a sequence of clever snippets of dialogue, leading inexorably toward one or two brief but ponderous exchanges. Here, we meander through a life conveyed through poetry and collage. The Tree of Life feels like a vivid waking dream, one that only hints at the path the protagonist has taken in contemplating his past. Despite ample talk of God in the film’s voiceovers, Malick’s ultimate vision seems distinctly secular: We have each other, we have this world, for just a tiny slip of time. Above all, Malick’s message is a compassionate one: we come into this world filled with joy and eventually, we become injured or distracted or greedy and we turn our eyes away from the divine grace of everything around us. But the lowest moments in our lives, the greatest hurts, present us with an opportunity to take in the full scope of what we have without fear, to gaze at the truth of who we are and where we come from and what we’ve lost without averting our gaze. No happiness lies in wealth or power. There are no clear answers from on high. As the father tells his son, “You’re all I have. You’re all I want to have.” We only have today, to breathe in this life, to savor it for exactly what it is, before it’s gone. Heather, it’s such an enlighting review. It says so many profound things without being spoilerish. I lost my sister to cancer two months ago and this text has been of great help. Thanks. “With a wide enough lens, a whole lifetime can look like a brief favor, granted by the universe, and our stories can seem as simple and as concise as haikus.” I can’t tell you how moved I was when reading this line. Who knew a single sentence could so adequately encapsulate a film so expansive. Bravo! Wow !!!! I absolutely loved your review. Beautifully written. Bravo! My husband and I have an online review show called Two Jews On Film. We see films before they come out and we usually disagree on them. This one is no exception. I thought The Tree Of Life was a masterpiece. One of the most original films in cinematic history. It’s a film that I think people will love or hate. They’ll be many movie goers that just won’t get it. Again, great work. I only hope the film is as good as the review! Well done. I haven’t yet watched the movie. I’m a bit afraid to because sad movies usually knock me on my behind for about a week. I read this review and can FEEL the movie from your words! What a gift you have! I’m not sure I’m ready to see the movie..but I am in awe of your ability.